SPMM, it stands for Single Platform: Many Modules. This concept is an ergonomically-sound professional grade gear carrying solution that uses a belt (with or without suspenders) that can be equipped with an array of customized modules for carrying hand tool, instrument and device modules. A solution that utilizes a belt, or a belt and suspenders and modules. We know that the professionals such as electrical contractors, industrial maintenance, communications lineman, ground or wind turbine maintenance or construction crewmen can carry up to 20 pounds of gear. The Duckbill solution to carrying anything over 10 pounds is our SPMM Platform. This concept incorporates the use of our utility belt and modules that link together utilizing our patented MaxCon docking technology. Using our suspenders will aid in weight distribution and comfort. Additonally, the front struts of our suspenders are backed with Velcro® allowing you to use that space for easy access of critical gear. This belt, suspender and module-driven solution allows for any task, and any tool mix to be used anywhere, anytime and with any positioning priority of the modules and tools. It's all because of our MaxCon docking technology. This overlapping clamshell design is used on all of our modules. It utilizes the strength of Velcro®. 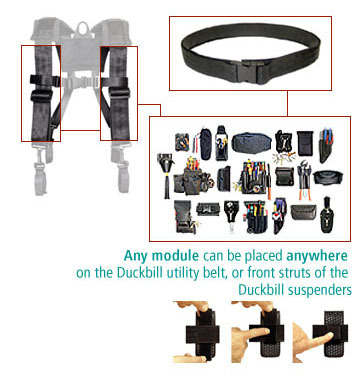 Once a module is positioned on a Duckbill utility belt or suspender strut it will not shift, slide or move. The clamshell docking also allows for easy repositioning of any module. Too much weight leads to pain. When carrying anywhere from 6 to 20 pounds of gear on their body, casual or sloppy tool weight allocation and movement of weight on a tool belt can lead to unnecessary neck, shoulder, back, hip and knee pain or Muscular Skeletal Disorders (MSD's) and eventually to premature personal health and enterprise productivity gaps due to time off of the job. Because the user of the Duckbill SPMM� Platform positions their tools and instruments (weight) on the platform that is most convenient and comfortable to them and at different locations on the platform, the load is distributed over an expanded portion of his or her muscular skeletal structure. The more muscles and bones that share in the work, the less any of them are overstressed or damaged. And because our modules don't move along the utility belt or suspenders, the body does not need to make incremental adjustments for the shifting weight, thus eliminating the stresses and strains put on the spine and muscles normally associated with typical tool belts. All Duckbill modules are rugged and purpose-specific constructed using Nytek material.